When it comes to picking a white paint colour for trims, doors and cabinets, there is a fiiiiine-line between what is flexible and what is most definitely not. Would you rather have a white that has the flexibility of a 10-year-old gymnast or a white that is as flexible as an 80-year-old armchair aficionado? Personally, I’d rather have a white that is in the form of wine – in ma belly. And I know you’re just shakin’ in yer boots right now hoping that your white trim isn’t on the hit list…and it might be. In fact, I can just imagine some of the comments that I’ll be getting from readers who have ‘said whites’ and LOVE them. And I agree, there are some homes that can pull off these whites fantastically! But THIS blog post is about long-term flexibility, about choosing a trim/cabinet colour that will work EASILY with a variety of products, styles, changing tastes, etc… So, I’m not saying that these particular whites are BAD, they are just a bugger to accommodate. The whites that I’m referring to have too much yellow in them. 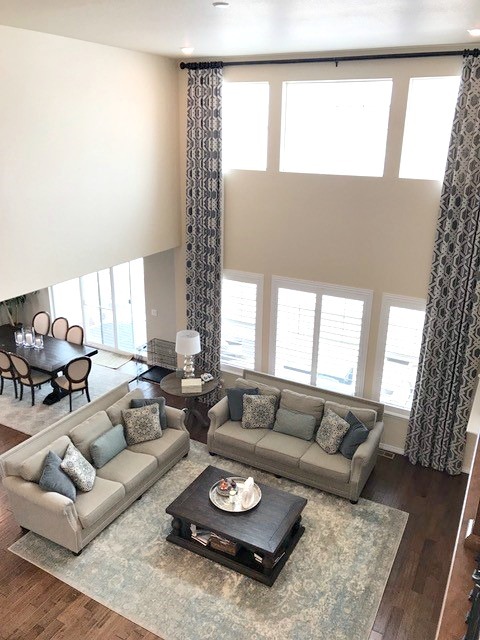 I rarely come across whites that are too blue, green or purple (only because they aren’t used very often) – it’s always the warm whites that throw things off whack in a design plan. If these whites look good now, that is GREAT, but should you want to change decorative directions, you could have a big problem on your hands. You see, there are many fantastic warm whites that are flexible and also happen to be some of my FAVE paint colours. They don’t even come CLOSE to being too cream or yellow, they are just ‘subtle and warm’. They suit warm colours, cool colours and a wild range of neutrals. Now the buggery colours that I’m going to reference are ALSO warm – they just aren’t as subtle about it. The stronger yellow in them reduces their flexibility and won’t let them accommodate a whole whack of colours – which is snobby designer speak for ‘lots’. So. You’re probably wondering what’s so WRONG with choosing these colours for your cabinets or trim, what’s the big deal? WHAT’S THE BIG DEAL? These colours are setting the STAGE for wall colours, finishes, furnishings and accents. They are the framework to your walls, windows, cabinets and floors, they are the starting point for any successful colour scheme. If these colours are limiting, you’ll have a FRACTION of the choices you might have had had you used a flexible white. 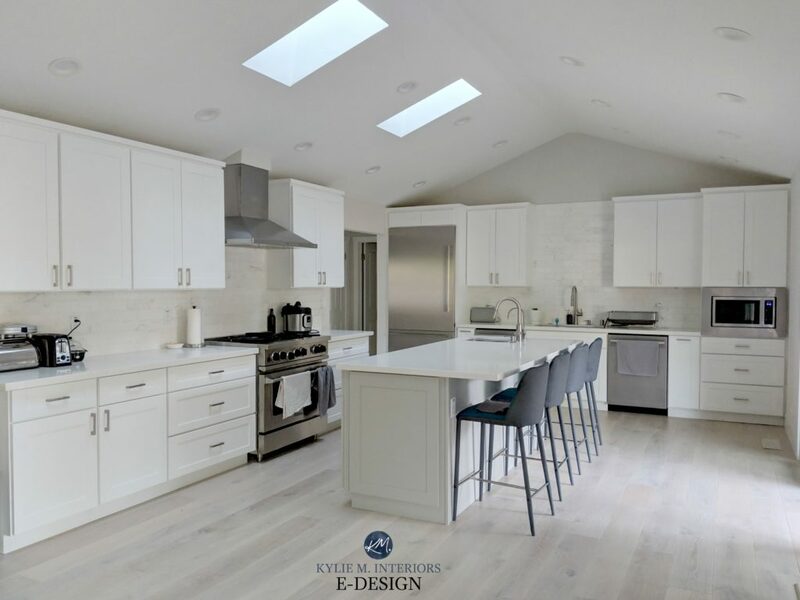 I’m not even sure why Navajo White is even on the TABLE as an OPTION for trim or cabinets as it isn’t white – yet I deal with it ALL the time in my Edesign. At the beginning of any Edesign consultation I ask the question, ‘do you need a trim colour suggestion or do you have an existing trim colour that you’d like me to work with?’ When Navajo White or Creamy (coming up next) are mentioned, I make a mad dash for the wine cabinet and grab the nearest funnel, anticipating the glory of explaining why these colours are hard to work around and probably WON’T work with the owners desire for gray or greige walls. 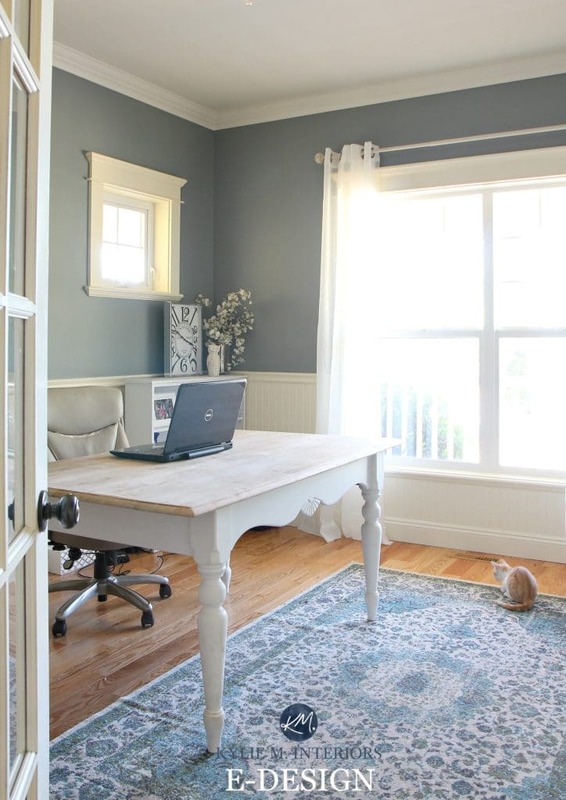 In the above photo of the home office, look at the colour of the small window trim vs the crown moulding – that is the difference between Navajo White and a more flexible white. The thing is, when we buy a home, we’re rarely walking into a perfect slate and in this case, the owners weren’t all too excited about having to paint ANY of the trim. 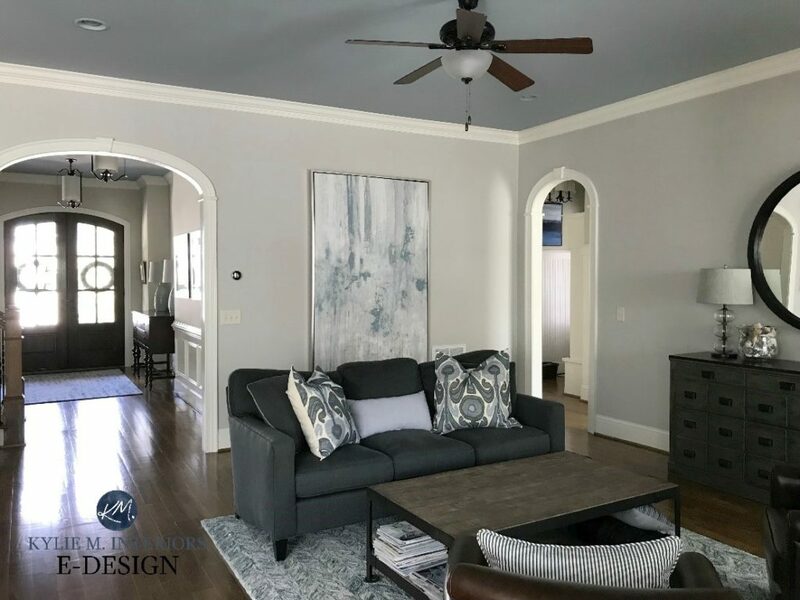 So, it was about finding a happy medium between what worked best for both trims AND the homeowner – and I think we did it! However, if there wasn’t any of the Navajo White trim, our options would’ve opened up CONSIDERABLY. Oh, I’m going to be burned at the STAKE like a wicked lil’ Ginger witch, but seriously, please don’t choose Creamy for your trim or cabinets. 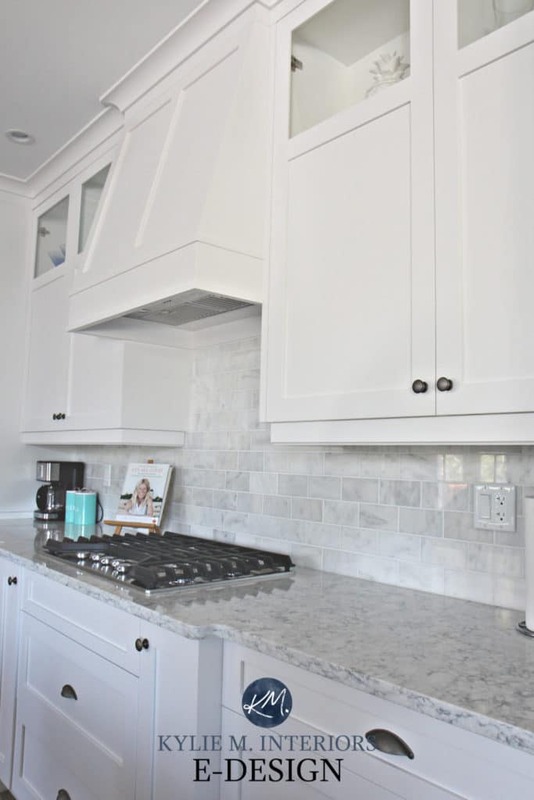 If you already have it and it’s working for you, then kudos, however, if you’re starting from scratch choosing trim/cabinet colours – you may want to look elsewhere for your perfect white. Why? It has too much yellow in it. If you ever dream of having anything but warm-toned beige walls, this colour and the likes will be the BANE of your existence. If you are considering RESALE and want a trim colour that is flexible to accommodate a range of neutral walls – don’t do it. 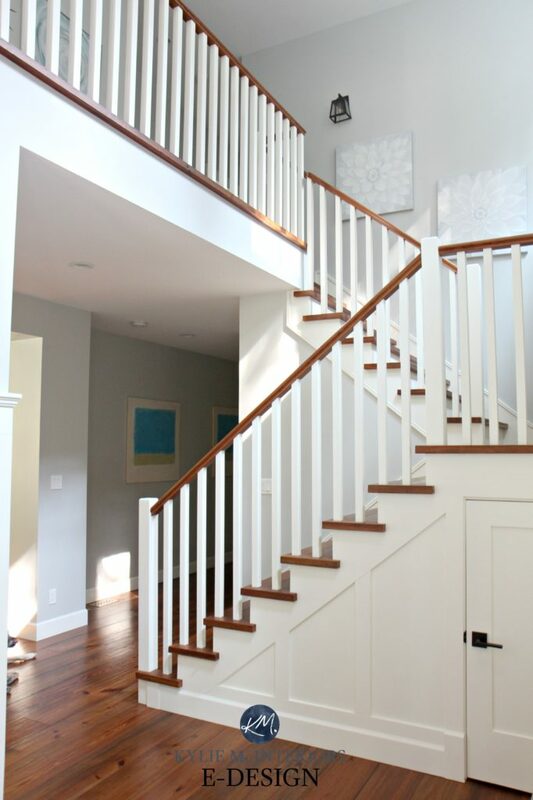 In the photo of the stairwell below, you’ll see SW Creamy on the WALLS and BM Cloud White on the trim – right where they belong! Of course, everything washes out with sunlight, so you’ll want to see the contrast where the baseboard/wall meet to see the shift. 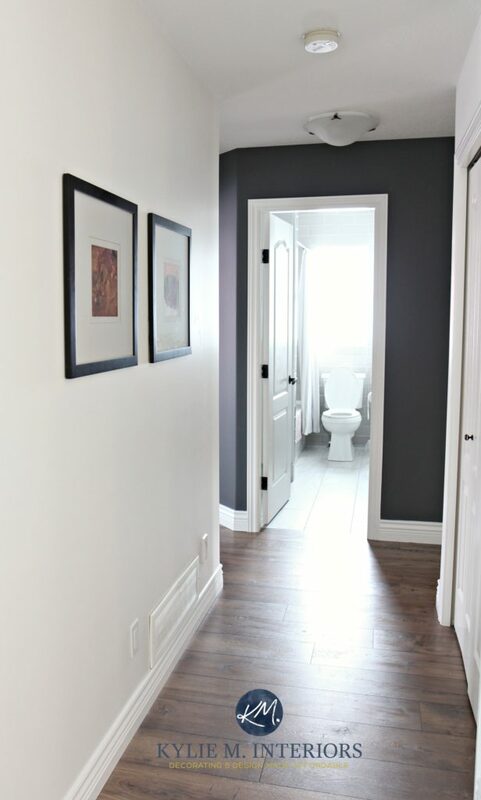 In the photo below of the hallway, you’ll see Creamy and Cloud White again. Had we put Creamy on the TRIM, we wouldn’t have been able to do that fantastic feature wall colour – no way Jose. Navajo White, Creamy and the likes are off-white, bordering on ‘light’ in depth. They are best suited for WALLS – not trim, not doors and definitely not cabinets. Are there exceptions? Heck yes! There’s the odd granite/backsplash combo that just BEGS for warm yellow-based colours like this – that actually NEED them. HOWEVER, they are few and far between. Again, Roman Column has tooo much yellow to be flexible. Unless you’re Big Bird. 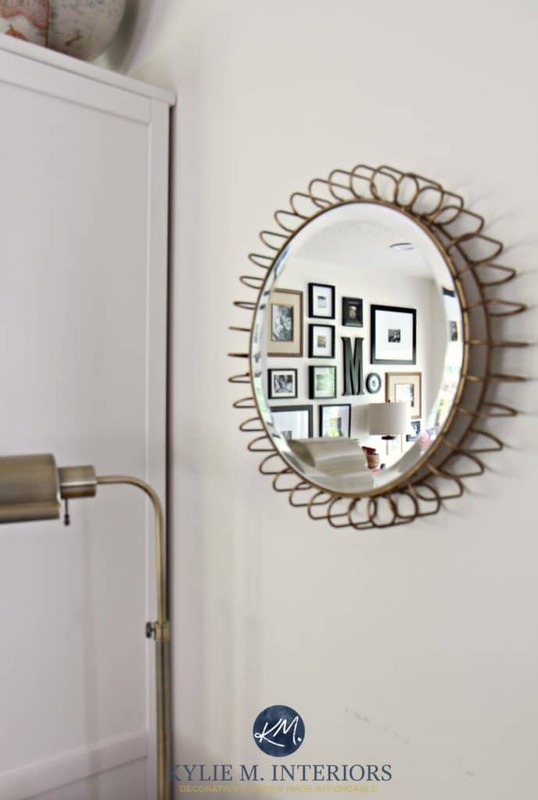 Antique White is another white that is super popular – personally, I LOVE it…on walls. However, it’s awfully warm for mass appeal and tricky if you want to go outside of the warmer beige range and into the gray/greige or cooler range. The above client hired me to work WITH the Antique White trim work. And while Antique White was on the island as well, I suggested that she paint the island to accommodate her style (based on the photos of her furniture in her previous home) but even then, it was SUPER hard for me to get her very far outside of the beige world she was in – it was more about an adjustment in undertone than a huge shift in colour. The current wall colour (Macadamia) was just a bit too green for the warmth of her travertine flooring. In her Edesign consultation, I gave her some new options to consider as well as a few thoughts re: the island, just to reduce the amount of yellow/cream that we had to work with. In the photo of the living room below, you can see how Dover White works with BM Collingwood walls. While Collingwood would prefer a more subdued white, it does work. You can see Dover White on the cabinets here with a beautiful granite countertop – again, it totally works! And although I’d like to see a backsplash with a bit more green in it to coordinate with the countertop, overall, things are soft and pretty looking. Now you probably want to know which whites I DO love, the whites that are warm – but flexible. Well, that’s a blog post unto itself and you’ll find it RIGHT here! Not sure which white is best for YOU and your home? Check out my E-design packages – I’d love to help! Hi Kylie! Do you like SW Incredible white for walls? I do like Incredible White, but just keep in mind that has a bit of a feminine slant to it and in some lights can have a bit of a taupe look (VERY slightly pink/purple). As long as you’re cool with that! I recall the trauma of BM Soft Shammy (or something like that) when we started the paint portion of our reno. I had picked it for cabinets and trim throughout the house to work with the biscuit tones in our quartz countertops. Thank goodness we started paint in the bedrooms and were able to bring the process to a screeching halt- the reflections in the moldings looked like heavy smokers had lived in the house for decades. That yellow/green undertone was the worst. Now my cabinets don’t quite “match” my cabinets, but I think they work. Fingers crossed Ill be calling you on a new project soon! What color is that feature wall? I love it! I’ve got a spot that I want to paint a dark color, and I’d love to test that out. Hi Dawn! The one down the hallway? That’s BM Gray 2121-10 – it’s really quite beautiful! This couldn’t come at a better time. I am remodeling my basement and it’s mostly painted SW Gossamer Veil. I was debating between several trim colors but now I think I’m going with SW Pure White which actually was my first choice. You just helped reaffirm that choice. Yes! Pure White would be great!